Condoleezza Rice, the former secretary of state for the Bush Administration, is “not interested” in being Donald Trump’s vice president, her chief of staff told Yahoo News on Friday. Instead, she reportedly plans to assist incumbent Republicans on the ballot in state elections, whose seats are thought to be in jeopardy due to Donald Trump’s controversial White House campaign. 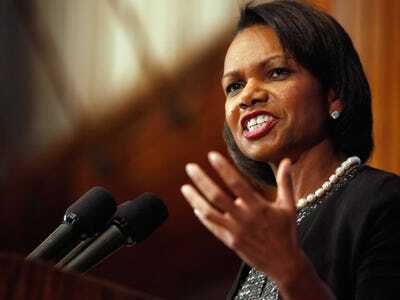 “(Rice) plans on doing a few events to help her friends in the Senate,” one source familiar with Rice’s plans told Yahoo News. Her work will apparently coincide with similar efforts from former president George W. Bush, who has already begun fundraising and supporting the campaigns of endangered Republican senators. Bush held a fundraiser earlier this week for Sen. John McCain of Arizona, who is up for re-election there. Both Rice and Bush, as well as a handful of other prominent GOP politicians and donors, say they’re skipping next month’s Republican National Convention in Cleveland, where Donald Trump is expected to be nominated as the party’s presidential candidate.